Some men are born to greatness. Others carve their part to it. Subroto Mukerjee was one of the latter category who paved the way to his own tryst with destiny and laid the foundations of India's Air Force in the process. The story of his life is one of determination, dedication and total commitment to the cause of the service that he guided from its inception till its transformation into the Air Arm of independent India. In the early 1930's, when the British government in India could no longer ignore the growing demands of the Indian people for greater representation in the higher ranks of the defence services, it grudgingly began the process of 'Indianisation' of the services. As a result, the Indian Air Force (IAF) came into being on 08 October 1932. In 1943, the first official Indian Air Force published 'history' was bought out as a small 30 page booklet "Ten Years Old" on the 10th year anniversary of the raising of the IAF. The booklet was authored by Wg Cdr W W Russell, a British expatriate residing in Bombay, but who served with the IAF Volunteer Reserve. This is the first chapter from that booklet - titled "Pioneers and Planners" that told the story of the IAF for the first time ever. The ariticle was also reproduced in the recent book on the RIAF - "The Eagle Strikes"
A short profile of late Air Commodore Narendra - A Cranwell trainee and one of the pioneers of the Indian Air Force. He was the third seniormost officer at the time of Independence after Subroto Mukherjee and Aspy Engineer. Very rarely do we find an external website or link to be of sufficient value that it is linked directly from our website. The Photo Collection of late Wing Commander Aizad Baksh Awan (Retd) falls under this exceptional category. Hosted by his Grandson Mr. Asad Awan (of Dera Ismail Khan, Pakistan) on the Flickr website, this collection of photos features previously unseen photos. Moreover , the captions accompanying them uncover previously unknown facts. The first five Indian Pilots commissioned into the Indian Air Force were H C Sircar, Subroto Mukerjee, Bhupendra Singh, A B Awan and Amarjeet Singh. A sixth officer, S N Tandon had to revert to Ground duties as he was too short! All of them were commissioned as Pilot Officers in 1933. Bhupendra Singh and Amarjeet Singh died in an air accident in Sept 33. HC Sircar left the IAF after a couple of years. Tandon died during World War Two. AB Awan opted for the Pakistani Air Force and retired as a Wing Commander. 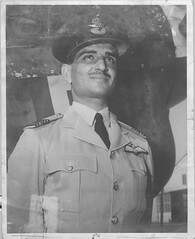 Subroto Mukerjee went on to become the first Indian Chief of Air Staff of the IAF.